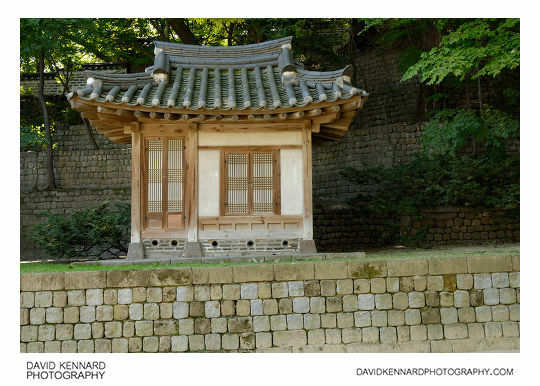 Carrying on through the palace garden we passed this small building called Ungyeonggeo (Hangeul: 운경거; Hanja: 韻磬居). 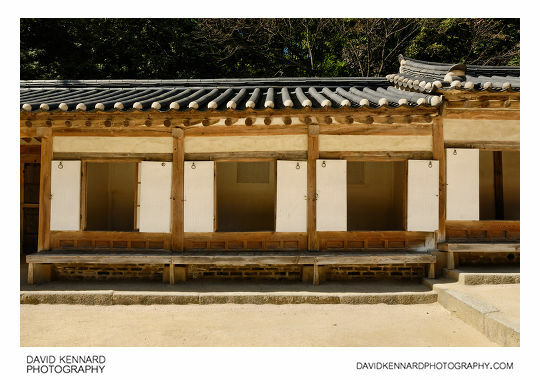 With only one room it is the smallest building in Changdeokgung. 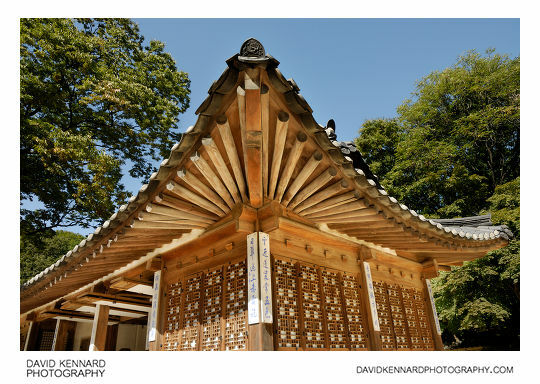 It was built by Crown Prince Hyomyeong in 1827, unlike most traditional Korean structures, it was not adorned with vivid paintwork. Following the path we come to Yeongyeongdang. 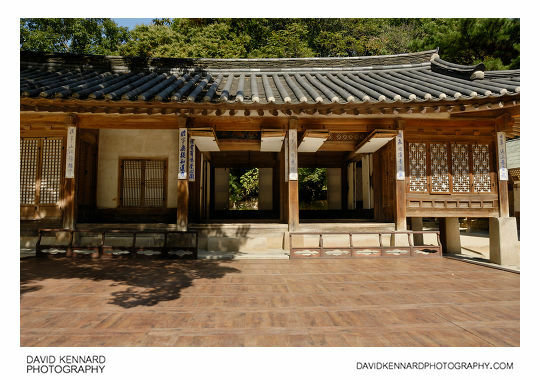 Like Ungyeonggeo, this building and the others surrounding it were built by Crown Prince Hyomyeong around 1827 and have a similar style. Yeongyeongdang was used to hold the Jinjakrye ceremony (Hangeul: 진작례; Hanja: 進爵禮) for the 40th birthday of Hyomyeong's mother Queen Sunwon. 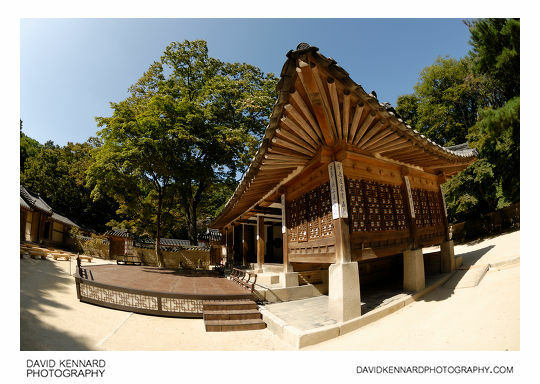 It was also used for the Jonho ceremony (Hangeul: 존호; Hanja: 尊號) to present a title for Hyomyeong's father King Sunjo. 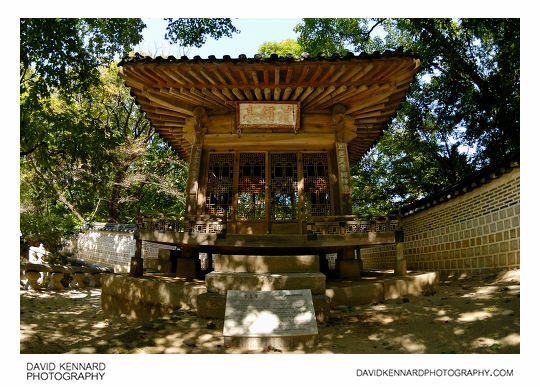 In a raised area near Yeongyeongdang is this small pavilion called Nongsujeong (Hangeul: 농수정; Hanja: 濃繡亭). While I did combine bracketed exposures for this photo, I didn't do a large enough bracket - the bright white highlights on the information board and the wall to the left distract from the main focus of the photo. Really I should have used my tripod and a larger bracket set for this photo. The west of the Yeongyeongdang area is enclosed by this long thin building. 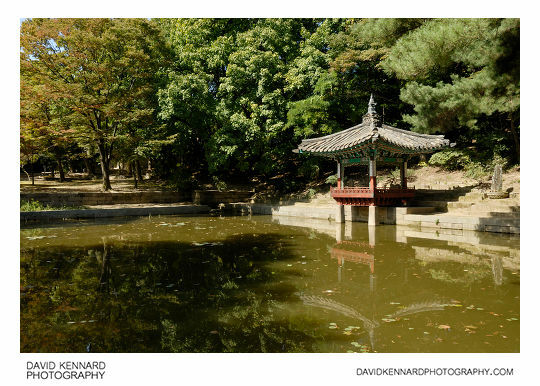 At the end of the pond is a small pavilion called Aeryeonjeong (Hangeul: 애련정; Hanja: 愛蓮), which used to be on a small island in the middle of the pond.